dance.net - Gavin Dress (10243145) - Read article: Ballet, Jazz, Modern, Hip Hop, Tap, Irish, Disco, Twirling, Cheer: Photos, Chat, Games, Jobs, Events! Gavin with eye catching sequin bodice and adorned with hundreds of Swarovski crystals. 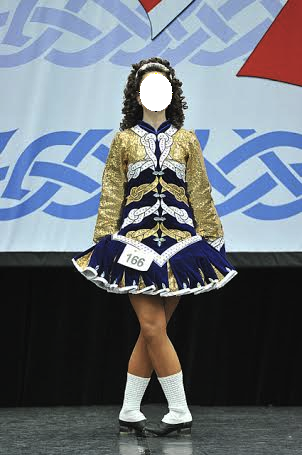 A rich violet colour contrasted by gold and white accents, this dress was worn at the North American Nationals. Would suit a teen dancer, 5' 5'', with room to take out or let in. Comes with bloomers and white crystal headband.